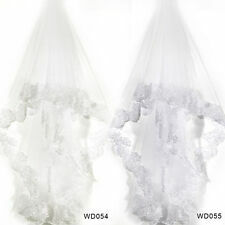 1 Bride Veil Comb White IvoryTulle Wedding Hen Party Accessories. TypeBride Veil Comb White Ivory Wedding Accessories. How to wear: Comb with veil, ready to wear. Veil's Style: Classic. Main ColourWhite Ivory. Material: Nets Yarn. Color: White. 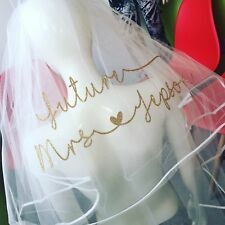 Personalised hen party veil. Font available in: gold, silver, grey, pink, blue or black. Please leave details of name and colour required in notes to seller. We are currently operating a 7-10 day turnaround on veils. If you require it urgently, please message us before ordering. Veil and sash combination also available for £14.99 - look in our shop for details! Message us if you require custom orders, hen party sashes etc! White veil with comb. 1pcs veil comb. Perfect for hen night parties. Also great for the Bride To Be,bridal shower,girls night out. Beautifully made plain 2T Girls Communion Veil. It has an embroidered scallop edge and an attached comb. Beautiful bridal wedding veil in black colour with lace edges,2 tiers, attached a black comb, size 1st tier 23", 2nd tier 31" in length, 36" wide, made of netting tulle. BLACK BRIDAL WEDDING VEIL. COLOUR Black. You Will Receive: 1 x Long Floor Veil. Colour Available: White. Material: Soft Satin. - Due to the difference between different monitors, the picture may not reflect the actual colour of the item. Length: 90" / 230cm. 1 x Veil (comb included). Veil:Lace satin cloth. Kit includes:Sash/Tattoos/Crown/Bride To BeVeil with Comb. Size : Veil : 40x50cm. Great accessory for Hen Night and Bridal Shower. Sash :160 9.5cm. Badge Rosette Features White sash with "Bride to be" writting. 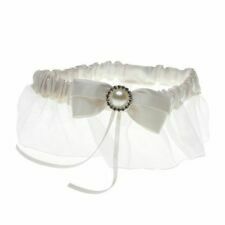 Bride veil feature 1 x Bride Garter. Perfect for hen night parties. 1 x Bride Sash. 1 x Bride Veil. Sash Features. 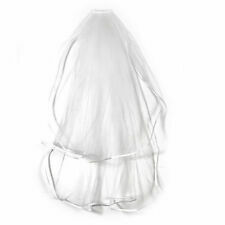 Long Length Ivory Wedding Veil Single Tier Bridal Veil. When it comes to your special day you want everything to be just right, from the big things down to the details. Your wedding veil is one of those details that can make a huge difference to your outfit. Luckily, you'll find a wide selection of wedding veils, from the very traditional to the ultra-modern, so there's bound to be something that suits your taste. Most of the wedding veils you'll find are made from tulle, with some having details in other materials at the edge of the veil. Many of the veils are bordered with a soft satin finish at the edge. Not only is the design simple and elegant the satin makes the veil's edge soft against the skin. 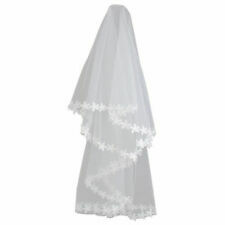 This would be a good choice if you're looking for a veil that won't detract too much attention from the rest of your wedding outfit. You can also find veils that combine different materials and embellishments. There are a number of veils on offer with a lace trim or beaded detailing, which would be ideal for picking out elements of your wedding dress. The majority of the wedding veils available are elbow or fingertip-length. If you're not sure about a long veil or you're worried about your veil catching the floor then a veil in one of these styles would be perfect. 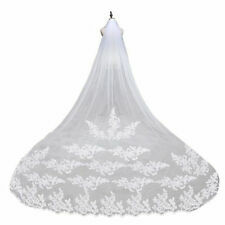 For a little more drama go for a long, trailing veil such as a chapel or cathedral style. You'll find both of these available and they are a great way to accentuate the train of a long wedding dress. You'll find the majority of wedding veils available in traditional wedding colours such as ivory or white. However, if you want something to contrast a white wedding dress, or if the whole colour scheme of your wedding is less traditional, then go for a black wedding veil.